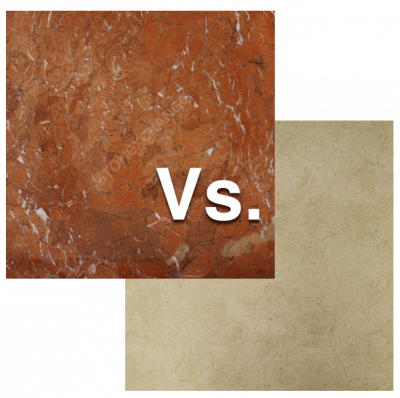 You’ve been tasked with choosing between marble or porcelain tile for your company’s office, but you don’t know the difference between the two. Given a jump-start with Google searches and images provided in an email from your boss, you decide to take research into your own hands and learn as much as you can about each of the tiles. From being critically acclaimed by artists and architects alike, it has been concluded that marble will last for eternity. With its glossy look and mass appeal, marble has been the favor of many modernized homes. The sophistication of marble is presented with ease, and you are only enticed even more if you happen to walk on this beautiful stone. Do not commit just yet, that is just the beginning! Found in your mid to late 2000’s American homes, porcelain tile is known for its dense and hard surface. With its versatility to match other stones like granite, the most common one is glazed. It’s difficult to scratch. This makes it easier to withstand someone wearing dress shoes or heels to stomp around in. You can also know that this option makes it relatively easy to invest in. > Decoration – Designers can easily decorate with marble, as it blends in with anything that you decide to match it with. This is why marble is accredited for its versatility when it comes to color scheme, styles, and patterns. > A Little Weighty – With great marble brings great weight. It’s highly recommended that you hire a professional for installation, as marble is extremely heavy and the process is tedious. If someone messes up while you are installing it, the product can become damaged. > Slippery When Wet – Not referencing Bon Jovi’s album, but marble loses it’s traction when cleaned or something is spilled on it. It can be very hazardous to have marble tile in the bathroom or kitchen. It is recommended to have a rug under spots such as the shower or sink. > You Pay For What You Get – We understand that marble is beautiful, but if you want luxury, you have to pay for luxury. The maintenance on it can be high, and the cleaning products that are specifically catered to marble can be pricy. Retain it All – Marble has been known to last for a very long time. If you keep up with the maintenance, marble has been known to last for decades at a time. With the proper sealant, stains are easy to wipe up as it slides across the marble instead of seeping into the stone. > Popularity – Porcelain tile is found to be the most popular tile among them all, and it has a more commercial appeal. For example, airports seem to get the most use out of porcelain tile, as it is known for its toughness. > Liquid Resistant – According to Home Improvement Pages, “The glaze used on porcelain tiles makes them practically waterproof and this is an excellent advantage in the bathroom, where spills and water splashes are a way of life.” Water will just sit on the tiles and not soak. Since they are waterproof, it also means that they are resistant to stains. > Crack! – Since all tiles are relatively heavy, the sub floor that the porcelain tile will be placed has on has to be durable and able to sustain the tile. If not, it can crack. > Patience is a Virtue – Because the tile is so dense, it can take a long time to make accurate cuts to put into the right place. It is recommended that you have professionals do this job as well, but they will make sure to slam you with a hefty price tag at the end because of the laborious work. > Grout – Merriam Webster describes it as “Material used for filling spaces or cracks between tiles.” It needs to be sealed immediately after placement, as regular use and exposure to constant humidity can begin to make it mold. Conflicted? Come to Nalboor Tiles! Here at Nalboor Tiles, we understand that you may have many questions that the Internet cannot answer. As a wholesale marble distributor, we strive to provide the best customer service for customers such as contractors and companies who buy in bulk. With our educated professionals, we are bound to answer all of those burning inquiries about each tile. Through our website, you can order a free sample, which will be delivered promptly. If you still need help deciding on which type of tile to choose, or have any more questions about Nalboor or are interested in purchasing any of our products, view our online catalog and contact us through our online form or our number, 305-501-4548.